Rather than celebrating nature in the tradition of the Hudson River School, George Inness' Lackawanna Valley seems to commemorate the onset of America's industrial age. 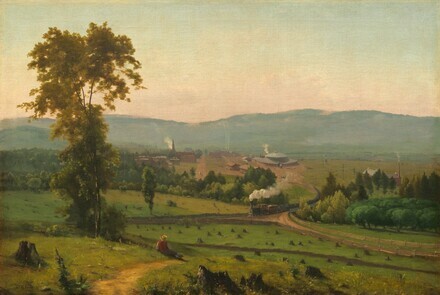 While documenting the achievements of the Delaware, Lackawanna, and Western Railroad, Inness has also created a topographically convincing view of Scranton, Pennsylvania. The artist took relatively few liberties with his composition, but in compliance with the wishes of his corporate patron, he intentionally exaggerated the prominence of the railroad's yet-to-be-completed roundhouse. His inclusion of numerous tree stumps in the picture's foreground, although accurate, lends an important note of ambiguity to the work. Whether it is read as an enthusiastic affirmation of technology or as a belated lament for a rapidly vanishing wilderness, this painting exemplifies a crucial philosophical dilemma that confronted many Americans in the 1850s; expansion inevitably necessitated the widespread destruction of unspoiled nature, itself a still-powerful symbol of the nation's greatness. Although it was initially commissioned as an homage to the machine, Inness' Lackawanna Valley nevertheless serves as a poignant pictorial reminder of the ephemeral nature of the American Dream. Commissioned c. 1856 by the Delaware, Lackawanna, and Western Railroad, Scranton, Pennsylvania. The artist, from 1891; by inheritance 1894 to his daughter, Mrs. Jonathan Scott Hartley, New York; (her sale, American Art Association, New York, 24 March 1927, no. 76, as The First Roundhouse of the D. L. and W. R. R. at Scranton); (Henry Schultheis Co., New York); (sale, Parke-Bernet Galleries, New York, 24 February 1938, no. 54, as The First Roundhouse of the D.L. & W. Railroad, Scranton, Pennsylvania); (Henry Schultheis Co., New York); sold 24 May 1944 to (M. Knoedler & Co., New York); purchased February 1945 by Millicent Rogers [Mrs. Huttleson Rogers, 1902-1953], Washington, D.C.; gift 1945 to NGA. Commissioned of Inness at about this time and later sold by the railroad at an unknown date. The information that Henry Schultheis was both consignor and purchaser at the 1938 sale was kindly provided by Grete Meilman, of Sotheby Parke Bernet's American painting department, in her letter of 11 July 1980 to Franklin Kelly (in NGA curatorial files). The dealer's name was spelled incorrectly as Schulteis in the NGA systematic catalogue published in 1996. The dates of purchase by Knoedler and Mrs. Rogers were kindly provided by Melissa De Medeiros, Knoedler Librarian, in her letter of 6 January 1993 to Nicolai Cikovsky, Jr. (in NGA curatorial files). The Knoedler purchase date was incorrectly published as 14 May in the 1996 NGA systematic catalogue. According to the 21 May 1945 minutes of the NGA Board of Trustees, Millicent Rogers, living in Washington at the time, offered to purchase the painting for the NGA. It was then owned by M. Knoedler & Co., New York. American Painting from the Eighteenth Century to the Present Day, Tate Gallery, London, 1946, 15, no. 120. George Inness: An American Landscape Painter 1825-1894, George Walter Vincent Smith Art Museum, Springfield, Massachusetts; The Brooklyn Museum; Montclair Art Museum, New Jersey, 1946, no. 5, pl. 5. The Railroad in Painting, Dayton Art Institute, Ohio, 1949, no. 33, repro. American Processional, Corcoran Gallery of Art, Washington, D.C., 1950, 245, no. 203, repro. 259. The Paintings of George Inness, University Art Museum, University of Texas, Austin, 1965-1966, 14-15, no. 8, repro. 7. Nineteenth-Century America: Paintings and Sculpture, The Metropolitan Museum of Art, New York, 1970, no. 95, repro. The American Scene 1820-1900, Indiana University Art Museum, Bloomington, 1970, 60, no. 27, repro. 60. Wilderness, Corcoran Gallery of Art, Washington, D.C., 1971, no. 114 (organized by the National Endowment for the Arts). American Light: The Luminist Movement, 1850-1875, National Gallery of Art, Washington, D.C., 1980, 150, fig. 181. The Railroad in the American Landscape: 1850-1950, The Wellesley College Museum, Massachusetts, 1981, 79, no. 8, repro. 78 and cover. George Inness, The Metropolitan Museum of Art, New York; The Cleveland Museum of Art, Ohio; Minneapolis Institute of Art, Minnesota; Los Angeles County Museum of Art; National Gallery of Art, Washington, D.C., 1985-1986, 74, 76, repro. 75. The Pastoral Landscape: The Modern Vision, The Phillips Collection, Washington, D.C., 1988-1989, no. 130, fig. 201. Northeastern Pennsylvania in Art: A Century of Tradition, Everhart Museum, Scranton, Pennsylvania, 1990, unpaginated brochure, repro. Loan for display with permanent collection, Corcoran Gallery of Art, Washington, D.C., 1991-1992. The Railway: Art in the Age of Steam, Walker Art Gallery, Liverpool; The Nelson-Atkins Museum of Art, Kansas City, 2008-2009, no. 39, repro. The Great American Hall of Wonders: Art, Science, and Invention in the Nineteenth Century, Smithsonian American Art Museum, Washington, D.C., 2011-2012, fig. 89. A moderately thin off-white ground covers a medium-weight, plain-weave, double-threaded fabric that has been lined. Paint was applied in a medium-thick film with highlights of the foliage in the foreground in impasto but otherwise wet-over-dry, with much visible brushwork. The pitted and quilted texture of paint and ground in the sky is unlike the rest of the painting, suggesting that it was repainted, perhaps by the artist himself. Cracks reveal a lower paint layer. Infrared reflectography discloses a ruled grid pattern that resembles a similarly ruled study drawing. The painting is in very good condition, with paint loss and old inpainting throughout, and a large area of loss to the right of the roundhouse. In 1971, the painting underwent varnish removal and was restored. The varnish has become slightly yellowed; the inpainting has discolored. "His Art, His Religion." New York Herald (12 August 1894). Inness, George, Jr. Life, Art and Letters of George Inness. New York, 1917: 108, 111. "Inness Paintings to be Sold at American Art." Art News 25 (12 March 1927): 11, repro. "George Inness-Painter." The Index of Twentieth Century Artists 4 (December 1936): 360. Young, Kathryn. "D. L. & W. president demanded more trains; artist Inness said no-but had to eat." Printer's Ink 207 (30 June 1944): 18, repro. "The National Gallery's First Inness." Antiques 48 (August 1945): 96, 98, repro. McCausland, Elizabeth. George Inness: An American Landscape Painter, 1825-1894. Exh. cat. George Walker Vincent Smith Art Mus., Springfield; The Brooklyn Mus. ; Montclair Art Mus., New Jersey. Springfield, Mass., 1946: 4, 21, 24, 28, 40, 68, repro. 11. Born, Wolfgang. American Landscape Painting. New Haven, 1948: 156-159, repro. 158. Walker, John. "American Masters in the National Gallery of Art." National Geographic Magazine 94 (September 1948): 298, repro. 316. Larkin, Oliver W. Art and Life in America. New York, 1949: 213. Walker, John. Paintings from America. Harmondsworth, England, 1951: 23-24, 44, pl. 22. Cairns, Huntington, and John Walker, eds., Great Paintings from the National Gallery of Art. New York, 1952: 174, color repro. Jenson, Oliver. "Farwell to Steam." American Heritage 9 (December 1957): 66, repro. Shapley, Fern Rusk. Comparisons in Art: A Companion to the National Gallery of Art, Washington, DC. London, 1957 (reprinted 1959): pl. 152. Bouton, Margaret. American Painting in the National Gallery of Art. Washington, D.C., 1959 (Booklet Number One in Ten Schools of Painting in the National Gallery of Art, Washington, D.C.): 6, 24, repro. 25. The American Heritage Picture History of the Civil War. New York, 1960: repro. 14. Walker, John. National Gallery of Art, Washington, D.C. New York, 1963 (reprinted 1964 in French, German, and Spanish): 284, repro. Marx, Leo. The Machine in the Garden: Technology and the Pastoral Ideal in America. New York, 1964: 220-221, pl. 2. Ireland, LeRoy. The Works of George Inness: An Illustrated Catalogue Raisonné. Austin, 1965: 28, repro. Cairns, Huntington, and John Walker, eds. A Pageant of Painting from the National Gallery of Art. 2 vols. New York, 1966: 2:482, color repro. Green, Samuel M. American Art. New York, 1966: 258, repro. 259. Neumeyer, Alfred. "George Inness." In Kindlers Malerei Lexikon, edited by Germain Bazin, et al. 6 vols. Zürich, 1964-1971. Zürich, 1966: 3:392, repro. The Paintings of George Inness. Exh. cat. University of Texas Art Museum, Austin, 1966: 14-15, repro. 7. Callow, James T. Kindred Spirits: Knickerbocker Writers and American Artists, 1807-1855. Chapel Hill, North Carolina, 1967: 127. Rinhart, Floyd, and Marion Rinhart. American Daguerreian Art. New York, 1967: 61, repro. 74. American Paintings and Sculpture: An Illustrated Catalogue. National Gallery of Art, Washington, 1970: 72, repro. Cikovsky, Nicolai, Jr. "George Inness and the Hudson River School: The Lackawanna Valley." The American Art Journal 2 (Fall 1970): 36-57, repro. Flexner, James Thomas. Nineteenth Century American Painting. New York, 1970: repro. 174. Campbell, William P. "The American Heritage at the National Gallery of Art." The Connoisseur 178 (December 1971): 270. Cikovsky, Nicolai, Jr. George Inness. New York, 1971: 30, fig. 11. Valsecchi, Marco. Landscape Painting of the Nineteenth Century. Greenwich, Connecticut, 1971: 318, pl. 277. Haber, Francine. "American Mythologies in Painting. Part III: Discovering the New Landscape of Technology." Arts Magazine 46 (February 1972): 32-33, repro. 33. Glubock, Shirley. The Art of America from Jackson to Lincoln. New York, 1973: 8, repro. Werner, Alfred. Inness Landscapes. New York, 1973: 12, 18, 20, 24, repro. 25. Wilmerding, John, ed. The Genius of American Painting. New York and London, 1973: 131, repro. 137. Bermingham, Peter. American Art in the Barbizon Mood. Washington, 1975: 27-28, 100, fig. 19. Walker, John. National Gallery of Art, Washington. New York, 1975: 548, repro. 549. Kasson, John F. Civilizing the Machine: Technology and Republican Values in America 1776-1900. New York, 1976: 176-177, 179, repro. 173. McShine, Kynaston, ed. The Natural Paradise: Painting in America 1800-1950. New York, 1976: repro. 147. Wilmerding, John. American Art. Harmondsworth, England, and New York, 1976: 152-153, 259, pl. 185. Brown, Milton W. American Art to 1900. New York, 1977: 342. Cikovsky, Nicolai, Jr. The Life and Works of George Inness. New York, 1977: 176-177, fig. 16. Arkelian, Marjorie Dakin, and George Neubert. George Inness Landscapes: His Signature Years, 1884-1894. Exh. cat. Oakland Museum of Art. Oakland, California, 1978: 14-15, repro. 14. Cikovsky, Nicolai, Jr. "'The Ravages of the Axe': The Meaning of the Tree Stump in Nineteenth-Century American Art." The Art Bulletin 61, no. 4 (December 1979): 619-620, repro. American Paintings: An Illustrated Catalogue. National Gallery of Art, Washington, 1980: 180, repro. Lewis, Pierce. "When America was English." Geographical Magazine 52 (February 1980): repro. 347. Wilmerding, John. American Light: The Luminist Movement, 1850-1875, Paintings, Drawings, Photographs. Exh. cat. National Gallery of Art, Washington, D.C., 1980: 150, repro. Wilmerding, John. American Masterpieces from the National Gallery of Art. National Gallery of Art, Washington, D.C., 1980: 15, 98, no. 30, color repro. Walther, Susan Danly. The Railroad in the American Landscape. Wellesley, 1981: 79, repro. 78 and cover. Williams, William James. A Heritage of American Paintings from the National Gallery of Art. New York, 1981: 123, 124, repro. Walker, John. National Gallery of Art, Washington. Rev. ed. New York, 1984: 544, no. 821, color repro. Cikovsky, Nicolai, Jr., and Michael Quick. George Inness. Exh. cat. Los Angeles County Museum of Art; The Metropolitan Museum of Art, New York; National Gallery of Art, Washington, D.C. Los Angeles, 1985: 17, 74, 76, repro. 75. Carfritz, Robert Lawrence Gowing and David Rosand. Places of Delight: The Pastoral Landscape. Exh. cat. National Gallery of Art and The Phillips Collection, Washington, D.C., 1988: 230, repro. 215. Cikovsky, Nicolai, Jr. "George Inness' The Lackawanna Valley: 'Type of the Modern'." In The Railroad in American Art: Representations of Technological Change, edited by Susan Danly and Leo Marx. Cambridge, Mass., 1988: 71-91, repro. 72. Wilmerding, John. American Masterpieces from the National Gallery of Art. Rev. ed. National Gallery of Art, Washington, D.C., 1988: 112, no. 33, color repro. "Northeastern Pennsylvania in Art: A Century of Tradition." Museum Quarterly. Scranton, Pennsylvania, 1990: n.p., repro. American Paintings: An Illustrated Catalogue. National Gallery of Art, Washington, 1992: 209, repro. Kammen, Michael. Meadows of Memory: Images of Time and Tradition in American Art and Culture. Austin, 1992: 78, repro. 81. Marx, Leo. "Does Pastoralism Have a Future?" Studies in the History of Art 36 (1992): 218-221, fig. 5. National Gallery of Art, Washington. National Gallery of Art, Washington, 1992: 234, repro. Pike, Frederick B. The United States and Latin America. Austin, 1992: repro. 20. Cikovsky, Nicolai, Jr. George Inness. New York, 1993: 32, 33, 34, color repro. 32. Kelly, Franklin, with Nicolai Cikovsky, Jr., Deborah Chotner, and John Davis. American Paintings of the Nineteenth Century, Part I. The Collections of the National Gallery of Art Systematic Catalogue. Washington, D.C., 1996: 350-354, color repro. Hand, John Oliver. National Gallery of Art: Master Paintings from the Collection. Washington and New York, 2004: 324, no. 260, color repro. Butterfield, Andrew. "The Genius of George Inness." Review. The New York Review of Books. 55, no. 14 (September 25, 2008): 8. Lyons, Maura. “An Embodied Landscape: Wounded Trees at Gettysburg.” American Art 26, no. 3 (Fall 2012): 54-55, color fig. 9.